D. Tracing his lineage back will prove that he is of the tribe of Levi through Levi’s son Kohath. B. 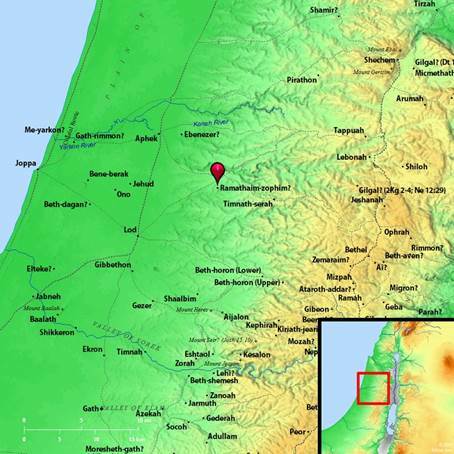 It was located in the mountains of Ephraim that extended into the territory of Benjamin. C. It derived from the Levitical family of Zuph or Zophai from which Elkanah descended. …and his name was Elkanah, the son of Jeroham, the son of Elihu, the son of Tohu, and son of Zuph, an Ephrathite. 1. Meaning of his name: God of him (Strong, 453) or He is my God (BDB). 2. Also called Eliel (I Chron. 6:24) and Eliab (I Chron. 6:27). a. Meaning of his name: to depress, abasement (Strong, 8459) or lowly (BDB). b. Called Nahath (I Chron. 6:26) and Toah (I Chron. 6:34). b. Also called Zophai (I Chron 6:26). c. He sprang from Kohath, the son of Levi. (NOTE: The lineage would prove that Samuel could occupy the position of a priest in Israel since he sprang from the lineage of Levi). C. NOTE: She was the favored one of Elkanah (See I Sam. 1:5, 8). …and Peninnah had children, but Hannah had no children. This sets up the strife that develops between the two women. Having children was a blessing form God, but being barren was a curse. A. Jewish males were required to go to worship at the tabernacle three times each year: Passover, Pentecost, Day of Atonement (Exo. 34:23). B. It could have been any one of these three feasts that is being referenced. Some believe that it was the Passover Feast since it was the one most often attended by families as well. B. BDB: to bow down, to prostrate oneself. B. It was here that the tabernacle was erected once the Israelites had subdued the land of Canaan (Josh. 18:1). E. It is interesting to note that the ark will remain in Shiloh, except for a brief period of time, until it is moved permanently to the city of Jerusalem in the days of David. 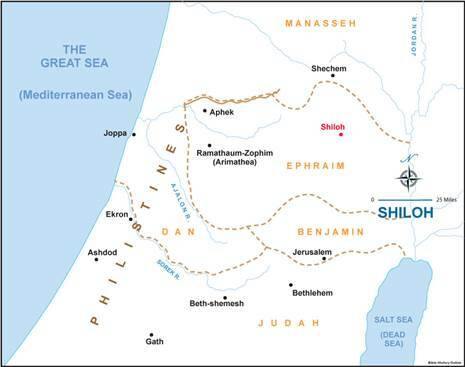 Thus, it was in Shiloh for a period of about 500 years. A. Eli was the high priest of Israel, as well as, their judge (I Sam. 1:9; 4:18). B. “Eli was a descendant of Ithamar, the fourth and youngest son of Aaron the High Priest. He became High Priest (Kohen Godol) after the death of Pinehas, the son of Elazar, Ithamar's older brother. We are not told why Eli succeeded to the High Priesthood, instead of Pinehas's son” (https://www.chabad.org/library/article_cdo/aid/112391/jewish/Eli-The-High-Priest.htm). …And the two sons of Eli, Hophni and Phinehas, the priests of the Lord, were there. A. Elkanah gave Hannah a worthy portion. 1. Elkanah not only gave Hannah her due portion, he also gave her the portion that appeared before his face. 2. He gave her one portion for two faces, thus, a double portion. …because the Lord had shut up her womb. B. We might as the question: “Why would God do this? 3. NOTE: Had Hannah had this child in a normal way, she might not have dedicated him to the Lord as she did. And her adversary also provoked her sore, for to make her to fret, because the Lord had shut up her womb. And as he did year by year, when she went up to the house of the Lord, so she provoked her; therefore she wept, and did not eat. A. She wept and did not eat. 1. Others can become our adversary (See I Sam. 1:6). 2. Others can have some control over us. 3. Others can and do take advantage of our weakness. 4. Others are not satisfied with taking advantage of our weaknesses just once. They continue their evil actions over and over and over. 5. The evil that others cause us can adversely impact our well-being, both emotionally (she wept) and physically (did not eat). (Some have been impacted spiritually). B. He did not understand. Three times he asked the “why” question. He was definitely confused. A. Our outward goodness to others does not heal the emotional hurt inside. B. Gifts do not always heal emotional wounds. C. Only two things would enable Hannah to have happiness. A. It is possible to love one person more than another. Elkanah loved Hannah more than Peninnah. B. Circumstances cannot always be perfectly fair in a family. Peninnah had children, but Hannah was barren. C. A mate can favor one spouse more than another. Elkanah gave Hannah a “worthy portion” and was better to her than ten sons. D. The two wives can have struggles. Peninnah provoked Hannah year after year.